Codetree supports creating dependencies between issues using the "needs #blocker_issue_number" and “needed-by #blocking_issue_number" keywords. If the issue you’re setting up a dependency relationship with is in a different repository you can use a fully qualified issue number like this "organization/repository_name#issue_number". For example, if issue #2345 is blocked by issue #1234 you can type "needs #1234" in a comment on issue #2345 and we'll create a relationship showing issue #2345 is dependent on issue #1234. Similarly If you’re editing issue #1234 and you want to say that it blocks issue #2345 you can type “needed-by #2345” and we’ll setup a reverse dependency. 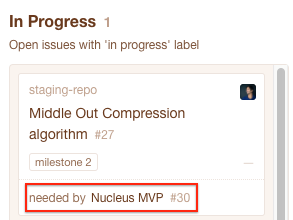 Reverse dependencies are a convenient way of creating “work item” issues that need to be completed before a larger issue (e.g. a feature) a whole is complete. 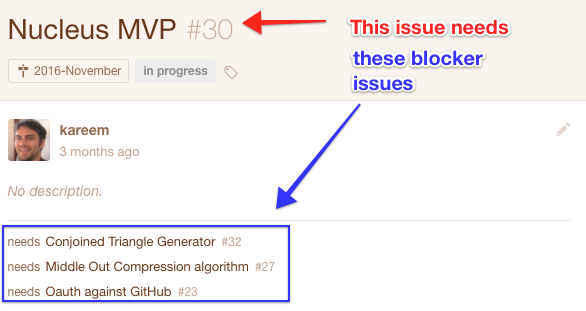 In the blocker issue, Codetree will list all the issues that are dependent on the blocker. Once you’ve setup dependency relationships between issues you can use Filters to fine all of the issues that are either blocking an issue or block and iissue. For example, if issue A needs issue B then issue A will show in a Filter with the “Blocked” filter set and issue B will show in a Filter with the “Blocking” filter set. In the Kanban board you'll see the same things. 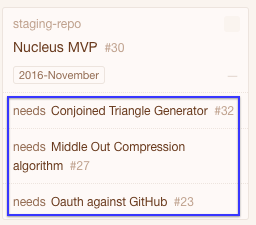 In this article we describe some ways we (and you) can use dependencies to better manage how you deliver features.